Sarmiento: getaway to the Petrified Forest - Sarmiento, Patagonia, Argentina. 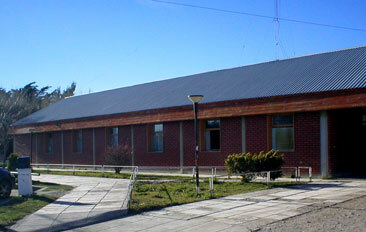 145 kilometers west of Comodoro Rivadavia it is Sarmiento, a small village close to 10,000 inhabitants. Its main economic activity is agriculture and livestock, due to its valley is irrigated by Senguer river. This peaceful village is settled in the southern province of Chubut, 45º 35' south latitude and 96º 05' west longitude. It is part of the so called Central Corridor of the Patagonia and its valley is a small oasis in the center of the solitary Patagonian plateau, where there are harvested fruits and vegetables and sheep and cattle are raised. It is also an important gas and oil basin with nearly 40% of the total production in the province. But its real importance lies in that very close, just 25 kilometers, it is one of the most important fossil reserves in the world: Jose Ormachea Petrified Forest, the largest of its kind in the world where you can find logs, leaves, branches, fruits and seeds petrified. 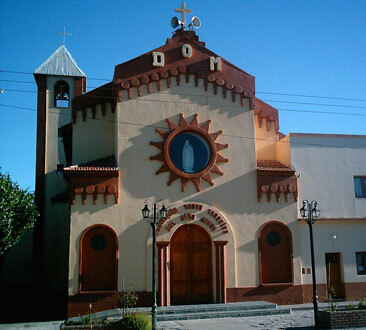 Sarmiento is one of the oldest towns in Patagonia, since it was founded on June 21, 1897. Its fertile valley is located between Lakes Musters and Colhué Huapi and it occupies an area of ​​42,000 hectares, in which agriculture is developed. Its climate is temperate-cold-dry, with average temperatures near 18 °C in the hottest month, January, and 4 °C in the coldest month, July. Although in the beginnings it was born as a colony of Welsh producers, in subsequent years Sarmiento received immigrants of various nationalities: Lithuanian, Spanish, French, Italians, Russians, Germans, Poles, Czechs, Swiss, Dutch, Lebanese. A true melting pot made up of 17 communities. It is located 449 kilometers from Esquel, with which it communicates by the Province Route 20, while with Comodoro Rivadavia it do so by the National Route 26. The city has campsites, hotels and restaurants where you can taste the place meat and vegetables, and the tasty trouts of Sarmiento. In addition, it has a hospital equipped for proper care of the visitors. Sarmiento stores in its bowels a rich archaeological, geological, paleontological and paleobotanical History. Testimonials ranging from 120,000,000 years (Pale vertebrates), 65,000,000 of its lavish age Petrified Forest, to 20,000 years of human presence (Pampa-Tehuelches and Mapuche). José Ormachea Petrified Forest After the folding which gave rise to the Andes, the great Patagonian forests were history. The Ormachea Petrified Forest is a preserved monument from that era. Sarmiento: what to see and do In the surroundings of Sarmiento you can perform various activities. From fishing on the famous Senguer river to tours by neighboring farms. You can also do visits to volcanic caves, rock paintings, rock climbing, etc. Petrified Forests How was originated the Petrified Forest of Sarmiento? Earthquakes, volcanic eruptions and hurricanes and other wheater phenomenons ended up with a forest in full swing to make it one petrified.